We have traveled all over the world and have had the privilege to visit some amazing places. Each place has its qualities that make it worth visiting and no matter where you go, and what you get out of the experience often has little to do with sites or monuments. What makes a place memorable, what connects us to the world are the unseen qualities, the deeper characteristics that ask us to go beyond what we can see and do to what we can feel. Mongolia asks much of the traveler who comes seeking something more than Instagram photos and cheesy souvenirs. Her treasures are well guarded but we got a glimpse of what this magical place has to offer. Mongolia is a place we will forever travel back to, and will always hold a special place in our hearts. Here are our top reasons why you should visit Mongolia. Most of us have heard of the Mongolian Empire and Chhingis Khan but how many people do you know that have travelled to Mongolia? Though tourism is growing in the area, Mongolia is still very little traveled and presents opportunities to really get lost and find some space, as well as connect with people in an authentic way. During our time there this Winter there was about a 2 week stretch where we didn’t encounter a single other foreign person as far as we knew. That is both liberating and exciting and shows that there are still wild places in the world. When you are able to travel off the beaten path you are given the opportunity to dig a bit deeper into a place, create bonds with the local people, and see places and life for what it really is, or as close as you can as a traveler. It is a real authentic experience. With that said, it presents an even more urgent need to be conscious of how the increasing tourism is done in Mongolia. As travelers we can have a huge impact and making sure that impact is a positive one is so important everywhere, but especially places that are growing in their tourism. 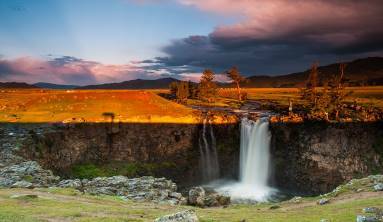 Not to be outdone by the wild landscapes, Mongolia has fascinating history and incredible culture that varies widely based on the region you find yourself. It really is like no other places we have been. The best way to understand and get an idea of the culture is by spending time with the indigenous and nomadic groups that call the wilds of Mongolia home. Taking a week or two and really getting to know a place and a people is really the only way to get at least a start on understanding these complex and beautiful people. You can spend time in the North with the Tsaachin people who herd reindeer and practice Shamanism. Or head out West and spend time moving around with the Kazakh people and learn about how they hunt with golden eagles. Looking at how people live and understanding how they live are two very different things. One is a surface level activity, and one requires commitment and an open mind and heart. Mongolia really is second to none in its variety of cultures and opportunity for connection and learning. The people of Mongolia are some of the kindest and warm hearted people you will meet. They are happy to welcome visitors into their homes, and are just as curious about you and your life as you about them. Wild is not merely a descriptive word, it really is a state of being, a state of primal existence that is at the core of the Earth and the human experience. In our modern world we have insulated ourselves from our wild nature, gotten away from what that means in our souls. In Mongolia you can re-discover what wilderness means, both on Earth and inside yourself. Mongolia has incredible landscapes and wildlife, many of which are unique only to this country. There are about 3.5 million people in Mongolia, and almost half of them live in the capital city of Ulaanbaatar. This leaves about 600,000 square miles of wilderness, room for nature to spread her wings and to find landscapes that are untouched. From the incredible peaks in the West, to the desert in the South, and the lush forest in the North, you will marvel at its beauty at every turn. One of our favorite memories was walking free in a huge mountain valley for hours on end, watching as camels ran by, herders moved around with their goats, spotting wild mountain sheep and being lucky enough to catch a glimpse of grey wolves running across the high plains. We even spotted the tracks of the elusive snow leopard that day. Mongolia is full with the wild places and things much of the world has lost, and it is there waiting for you. Mongolia holds opportunities for adventure no matter your age, ability, or fitness level. From trekking in the high Altai Mountains to walking the camel caravans of the Gobi desert, there is adventure at every turn. You can ride on horseback with the Reindeer herders in the North. If your sense of adventure is a bit less walking oriented, you can quench your thirst by settling into a Ger camp and just relaxing in the quiet and solitude of the backcountry. Watch the birds soar over the valley and look out across the plains at what true open space feels like. Food can be an adventure, and Mongolia has all the interesting, unique, and tasty foods you need to tantalize your taste buds. There is world class mountain biking, kayaking, and white water rafting as well as a growing rock climbing community that is just coming into its own. 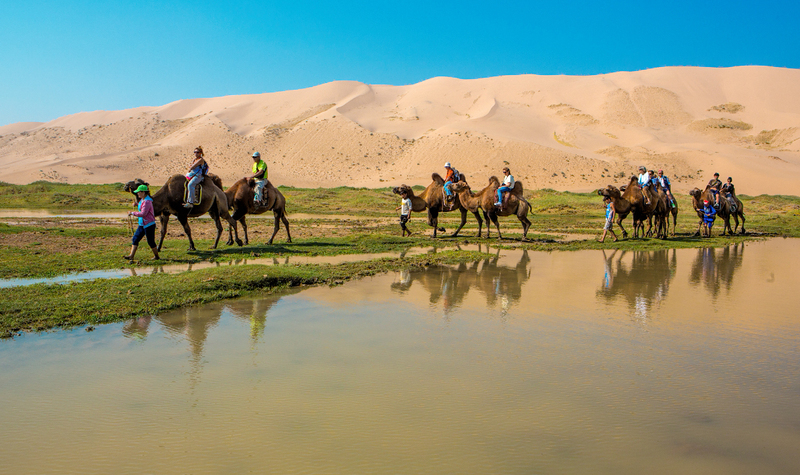 Adventure comes in many shapes and forms and Mongolia has it all and more. We are not big city people typically when we travel, but we were pleasantly surprised by Ulaanbaatar. The city is modern enough to have all the comforts and luxuries you want at the end of a long trip as well as world class art galleries, theatre, museums and fine dining.It is also a very walkable city that beckons you to wander and get lost in the streets and colors. It is a great place to have a reprieve from your incredible transformative experience before you head home. We will be releasing our Summer 2019 and Summer 2020 trips starting in January and they will fill fast! If you are interested in small group, custom, or large group trips get in contact with us and we can start the process early. We will have some very unique trips that will be sure to leave you transformed and wanting more. Stay tuned for more information! I love the nomadic living that is simpler way of life. Have been inquisitive to get a little deeper to know the lifestyle. Mongolia has been on my list since a couple of years. Thank you for this won’t post and places that are less public. We would love to help you on a journey to Mongolia. Let us know what you think!